It is with huge pride that we announce the launch of our new book by renowned beer writer, Pete Brown. As three times ‘Beer Writer of The Year’, author of eight other books, contributor to The Guardian and, of course, Ferment, as well as all-round-nice-guy, we couldn’t think of anyone more perfect to publish a book with. ‘The Story of Craft Beer: How it’s made and how to drink it’ is our attempt to create a straightforward, easy to read and, above all, fun book on the subject we all love dearly. Charting the history of beer, the definitions of key styles, how beer is made and Pete’s tips for enjoying it best, the book really is the perfect little companion to join you on your beer drinking journey. With the help of Berlin-based illustrator Jay Daniel Wright, we’ve created a book that is illustrated beautifully throughout. Most excitingly, the book has now become our new ‘Super Taster’ reward – so all members who are either Super Tasters or Master Tasters this month will have the book automatically added to their account. 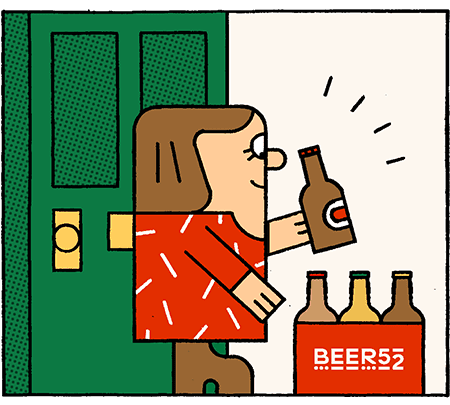 If you’re new to Beer52 – welcome! By collecting points on your beer drinking journey, you will become a ‘Super Taster’ after around three boxes, earning yourself a copy. We chose the London Craft Beer Festival as the perfect location to launch the book. Inviting many of our favourite brewers for a beery brunch at the excellent Strongrooms Bar & Kitchen (120-124 Curtain Road) in Shoreditch. The home of recording studios that have been graced by the likes of Radiohead, Nick Cave and The Prodigy, their bar made for a great setting for our little celebration. Over a brunch of Smoked salmon, caperberries & lemon with rye bread and sour cream, a platter of fresh doughnuts and an array of fresh fruit, Pete autographed copies of the book for all of the brewers who came along. The reaction we got was great and we’re super excited to hear what you think when you get your own copy in your box!